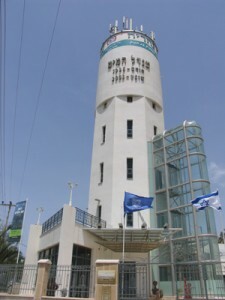 Nahariya’s water tower is the symbol of the city. Photo by Esther Hecht. Nahariya’s streets ring with the clip-clop of horses pulling Amish-style buggies filled with vacationers. This relaxed seaside resort, originally a farming community, is the capital of Western Galilee, and one of the prettiest areas in Israel, with sandy beaches, fertile fields and rolling hills. Though newer buildings are faced in stone or tile, older homes are all white stucco, like the courthouse, which is a block from the beach. Palm trees seem to be everywhere in this verdant city, 19 miles north of Haifa and 77 miles north of Tel Aviv. Also ubiquitous are roundabouts and speed bumps (sabagiyot)—introduced by and named after Mayor Jacky Sabag. Nahariya was one of the first cities in Israel to adopt them. Nahariya lies on the path of the Via Maris, the ancient trade route that linked Egypt with Syria, Anatolia and Mesopotamia. The Talmud did not consider this area part of the Land of Israel, and it became part of Israel officially only after the War of Independence. In 1934, Zionist leader Selig Soskin conceived of Nahariya—then the only Jewish settlement north of Arab Akko—as an agricultural utopia on privately owned land. The settlers would be middle-class Jews fleeing Nazi Germany. Soskin and three others formed Nahariya Small Holdings Ltd. to buy 5,000 acres of land from a Beirut family. They brought in expert advisers in construction, poultry breeding, fruit-tree planting and vegetable cultivation. By the end of 1935, there were 40 settlers. They formed a cooperative for purchasing and marketing and for all social and cultural tasks; by 1941 there were 1,000 residents. Transportation was by donkey and camel. A one-room school opened in 1936, then a two-room school that doubled as a synagogue. Nahariya was isolated during the Arab riots of 1936 to 1939. In 1937, Soskin represented the settlement before the Peel Commission, which decided to include Nahariya and the entire Galilee in the Jewish sector in its partition recommendation to the United Nations. But the Partition Resolution in 1947 made Western Galilee part of Arab Palestine. In 1938, four new settlements joined Nahariya: the communal farm Shavei Zion and the kibbutzim Hanita, Matsuba and Khirbet Zemach (today Eilon). During the War of Independence, Nahariya was isolated again and bombarded; only after the armistice agreements were signed did it officially become part of Israel. Nahariya’s founders in the 1930s had overestimated the profitability of the small farms, the immigrants’ suitability to the work and the adaptability of stone fruit to the climate. When agriculture failed, the settlers turned Nahariya into a health and seaside resort. Chaim Weizmann and David Ben-Gurion were among the early patrons. The sculpture garden at Mediatech. Food processing was another of the new occupations. The Strauss family, which had one of the first cowsheds, established a dairy in 1939 that eventually became a conglomerate producing dairy products and other foods. The Soglowek-Kvilecky family, which had owned a kosher butchery in Breslau, opened what became Soglowek Foods Ltd., today a national and international kosher meat processing firm and producer of other foods. 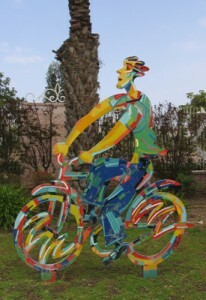 Andreas Meyer’s locksmith and bicycle shop developed into Nahariya Glass Ltd., now in the Tefen Industrial Park, which makes artistic glasswork. And Naot sandals had their origins in Nahariya, where Gideon Scheuer, the son of a Czech tannery owner, started repairing shoes for the settlers and then eventually began making them himself. After the War of Independence, the German Jewish population was augmented by immigrants from North Africa, Iraq and Romania. Today, Nahariya’s 52,000 residents include large Moroccan and Russian communities; about 5 percent are native English-speakers. The five main neighborhoods have a mix of secular and religious, young and old residents. A strong retiree community lives mainly near the city center. Some residents have been attracted by the tax break, granted because the city is within range of Hezbollah rockets. Also, the train to Haifa (36 minutes) and Tel Aviv (99 minutes) makes commuting easy. Less than one-third of the city’s synagogues are listed as Ashkenazic or “nondenominational.” Kehillat Emet veShalom is the northernmost Reform congregation in the country and one of the oldest in Israel (108 Weizmann Street; http://sites.google.com/site/evsnewsletter/home). Nahariya is the perfect base for visiting Western Galilee, Upper Galilee, Safed and Nazareth. Start your city tour at Lieberman House, the city’s heritage museum. Built in 1860, the house stood on a 111-acre tract of land bought by Phillip Lieberman in 1935. The settlers learned about agriculture at the experimental farm surrounding the handsome stone house. Lieberman never moved to Israel and perished in the Holocaust, but in 1945 his son Benedikt moved to Nahariya. Between 1935 and 1945, the house was the temporary residence of some of the founders of nearby Kibbutz Evron and of Shavei Zion, to the south; a base from which the Palmah carried out strikes under the command of Yitzhak Rabin; and a temporary sanctuary for illegal immigrants. After the war, it housed young Holocaust survivors and then Nahariya’s first secondary school. Yitzhak Avinu Synagogue. Photo by Esther Hecht. Book tours in English (Irit Street, off Road 4, near Hatzafon Mall; 011-972-4-982-1516; nahariyamuseums@gmail.com). Five minutes away in the Neve Menachem Begin neighborhood, the Yitzhak Avinu Synagogue has a relatively simple stucco and stone exterior but a lavish interior, with large brass engravings on the Ark and the central bima. 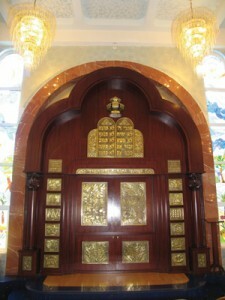 A marble arch frames the Ark, which is ornamented with the seven species and symbols of the 12 tribes. To the right, a brass Star of David surrounds a depiction of ancient Jerusalem with the Temple; the star on the left has a depiction of modern Jerusalem with the Knesset. The congregation is 80 percent Moroccan (5 Rotem; to visit, call Mordechai Vaknin, who doesn’t speak English well, 972-54-803-0708). From the synagogue, a short ride will bring you to the seaside promenade. Try your luck fishing from the pier, relaxing on the beach or checking out an amusement area for children. Other entertainment options include fitness equipment for adults, a rollerblading rink, Israeli folk dancing and a host of cafés and restaurants. The promenade extends south to Shavei Zion, a communal farming settlement founded in 1938 by German Jews, most of them from Rexingen. Proceed north on the promenade to Sderot Haga’aton, Nahariya’s main commercial street, through which the Ga’aton River flows. Giant eucalyptus trees shade the boulevard, which is lined with shops, restaurants and cafes. 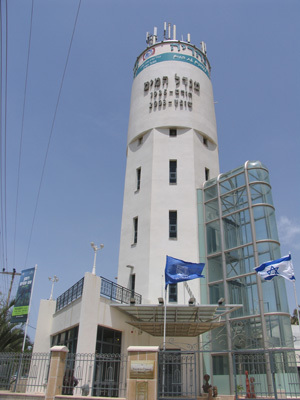 North of Haga’aton, on Jabotinsky, stands Nahariya’s water tower, the symbol of the city and one of its oldest landmarks. The white octagonal structure, 88 feet high, was completed in February 1936. In addition to supplying irrigation water, the structure served many purposes, including the office for Nahariya Small Holdings Ltd., the town’s first synagogue, cultural center and library, an observation post during World War II and a police station and jail in 1949. More recently, the annex has served as a cultural center and municipal art gallery, with group shows in the summer and single-artist shows the rest of the year (12 Jabotinsky; 972-4-951-1214). The Yad Lebanim memorial in the Givat Ussishkin neighborhood commemorates Nahariya’s fallen in all the country’s wars and terror attacks. A peaceful garden surrounding the hilltop memorial offers panoramic views. The names of the fallen appear on brass plaques on a wall facing the garden and on basalt stones in the hall inside. Schoolchildren have prepared a memorial album for each of the fallen. Yad Lebanim also serves as a cultural center, with an auditorium and a library containing books on Jewish culture, history and literature, some of them in English. Lectures can be arranged and the site can be rented for seminars (Yefe Nof Street; 972-4-982-8501). Return to Road 4 and turn right (north), to the corner of Har Tavor. The large round blue and silver building surrounded by a fence with a lyre motif is the Mediatech. This cultural center houses the municipal library, which contains a multimedia center, a Judaica library and a selection of English books for children and adults (972-4-985-5000; http://nahariya.library.org.il). Mediatech also contains a music center, an auditorium for concerts and a sculpture garden with works by Israeli artists, including David Gerstein and Yaacov Chefetz. At the garden’s northern end stand child-friendly, mosaic-covered sculpted critters. A few minutes to the north, off Road 4 on Ben-Gaon Street in the Rassco neighborhood, is the Nahariya Botanical and Zoological Garden, named for Bronia Hacker. Stroll through this pleasant spot to see a variety of trees and flowers as well as meerkats, swans, ostriches, kangaroos and other creatures (8 Ben-Gaon; 972-4-951-7491). 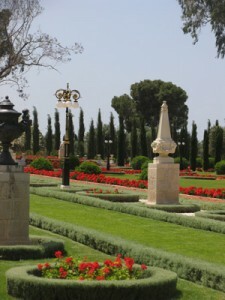 The Bahai Gardens. Photo by Esther Hecht. Nahariya is an excellent base for exploring Akko, about 6 miles south, whose Old City, with its rich Crusader, Italian, Napoleonic and Ottoman remains, has earned it a place on Unesco’s World Heritage Site list. The serene and beautiful Bahai Gardens at Bahji, at the northern end of Akko, are the holiest site for members of the faith and also a World Heritage Site. The outer gardens are open daily 9 to 4; the inner gardens are open Friday to Monday, 9 to noon (www.ganbahai.org.il). Returning to Nahariya on Road 4, pass the Ottoman aqueduct on your right; then take the first right. The world’s first Holocaust museum was established in April 1949 by young survivors at Kibbutz Lohamei Hageta’ot (the Ghetto Fighters Kibbutz). Today, it includes a separate museum, Yad Layeled, designed to help fifth-to-eighth-grade children learn about the Holocaust. In a large electronic installation in the entrance to the main museum, Hebrew and English letters come together to form the names of destroyed communities. Other exhibits include models of concentration camps, a depiction of the Jewish community of Warsaw before and during World War II, portrayals of Jewish resistance and works by various artists. The museum aims to foster “an understanding of the importance of humanistic and democratic values, and [instill] tools for moral judgment and civic responsibility.” English tours must be booked (972-4-995-8080; www.gfh.org.il). Three interesting sites lie to the north of Nahariya. The Bible tells us that Achziv was assigned to the tribe of Asher. First settled by the Phoenicians and the site of an ancient port, it lies between two creeks, Kziv and Sha’al, and was conquered by a succession of invaders. The Arab village Az-Zeeb existed here from the Middle Ages until 1948, when the villagers fled to Lebanon. Today, the site is a national park, with lagoons, archaeological finds and the remains of the village (www.parks.org.il). Proceed north about 100 yards on Road 4 to an orange sign in Hebrew on the right. To protest the British Mandate’s refusal to allow Jewish immigrants to enter Palestine, on the night between June 16 and 17, 1946, the Palmah set out to blow up 11 bridges that connected Palestine to neighboring countries. At one of the two Kziv Creek bridges, on the rail line connecting Cairo to Beirut, the explosives went off accidentally; 14 Palmah fighters were killed at the site. A circular stone memorial displays their names and recounts the events in the words of the author S. Yizhar. A path leads east to the remains of the bridge. In the white cliffs that meet the sea on the Lebanese border, six miles north of Nahariya on Road 4, the blue-green waters of the Mediterranean wash the enchanting grottoes of Rosh Hanikra (972-73-271-0100; www.rosh-hanikra.com). Formed by a process of erosion, the grottoes can be seen by day or night. A gondola lift, said to be the steepest in the world, descends to the grottoes and a hall with a sound-and-light show. Gila Green’s poem “Eight O’clock in Nahariya,” which appeared in the Deronda Review in 2008, portrays succinctly the terrifying rain of rockets during the Second Lebanon War. Nahariya resident, war veteran and peace activist Dov Yermiya became persona non grata in the Israel Defense Forces after publishing his critical memoir, My War Diary: Israel in Lebanon June 5-July 1, 1982 (South End), which provides eyewitness accounts of the First Lebanon War. David Witzthum’s 2004 documentary Nahariyade tells the city’s history through the story of Fritz Wolf, a lawyer from Germany who arrived in 1937 and became a postal clerk. He also wrote musicals that were performed by the founders. One musical, also called Nahariyade, portrays a day in the life of a Nahariya farmer (available from the Open Museums of Tefen, 972-4-910-9614; nily@omuseums.org.il). Of all Nahariya’s children, perhaps the best known is the soldier Gilad Shalit, who was 19 when he was abducted by Hamas in June 2006. He was released in October 2011. Today Shalit works as a sports columnist for the Yedioth Aharonoth daily. While The Juggler, in which Kirk Douglas stars as a Holocaust survivor, was being filmed in Haifa in 1952, the actors stayed at the Dolphin Hotel in Shavei Zion, just south of Nahariya. There they encountered a beautiful, 10-year-old Daliah Lewinbuch, and arranged for her to study ballet in Stockholm. Too tall to dance professionally, she became Israel’s first international movie star, stage-named Daliah Lavi, a fashion model and a singer. She lives in Asheville, North Carolina. Fredi Dura (1922-2006), a crooner with a bowtie, was the sole survivor of a large German Jewish family. He settled in Nahariya in 1956, worked as an entertainer there and on the Zim passenger lines and then opened a club in which his Yemenite wife was the bartender. During the 1960s and 1970s, Fredi’s Inn drew revelers from as far away as Tel Aviv. Salma Khal, Israel’s (and perhaps the world’s) first Bedouin model, was discovered in her hometown in 2004 by Elite Model Israel when she was 14. For a few months she was the poster girl for Diesel fashions. The sun, the beach where you can fish, surf, dive and sail and the natural beauty of Western Galilee make Nahariya a perfect vacation spot, at its best weather-wise in spring and fall. Getting to Nahariya is a snap: Hop the train from Tel Aviv, Ben-Gurion Airport or Haifa. Once there, sightsee on foot or by horse and buggy, bicycle or minitrain. The Carlton is one of Nahariya’s oldest and best-known spa hotels, with its own synagogue and within walking distance of many of the city’s attractions (23 Haga’aton; 972-4-900-5511; www.carlton-nahariya.com). The central synagogue, Heichal Aharon, just behind the Carlton, is named after the city’s first rabbi, Aharon Keller. The exterior is faced in cut white stone and the names of Nahariya’s fallen are inscribed on the walls of the foyer. Services follow the standard Israeli Ashkenazic rite but incorporate a few German customs (Yeshurun Street, between Shai Agnon and Ahad Ha’am; http://the-central-synagogue-nahariya.mykehila.com). Three kosher dining options, all of which offer dairy and fish menus, are Bordeaux (42 Haga’aton; 972-4-951-4079); Café Café (35 Haga’aton; 972-4-951-2350) and Kapulsky (Italian and Mediterranean cuisine) on the seaside promenade (972-4-992-1985). But while strolling on Haga’aton, pause to look at the Penguin Restaurant complex, which locals call “Pingvin” (33 Haga’aton; 972-4-911-9239). Founded in 1940 by the Oppenheimer family, it is a Nahariya institution now run by the family’s third and fourth generations and offers a rich, eclectic nonkosher menu. The strudel is very good and the hazelnut pie is divine. Walk to the back of the restaurant that opens out onto a garden and remember Nahariya in earlier times: It was here that the local girls would distract British soldiers while illegal immigrants sneaked ashore, and it was on this wooden floor that locals and vacationers would dance to live music when they came for their traditional 5 o’clock coffee.